Any “Plan B” for Brexit must take account of the Referendum result. The 2016 EU Referendum in the UK was held to determine whether the UK desired to Remain in or Leave the European Union. 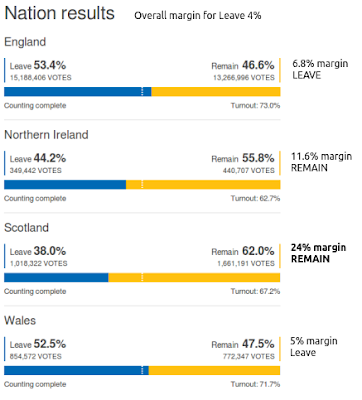 The result of the Referendum was a convincing majority to Leave the EU in England but large majorities for Remaining in Northern Ireland and Scotland. The large majorities for Remain in NI and especially Scotland have distorted the perception of the referendum as a “close run thing” about the EU when the closeness was actually about UK regional politics and not the EU per se. Having obtained a “Leave” result in the Referendum the Government then passed the European Union (Withdrawal) Act 2018 which has the explicit function of repealing the European Communities Act 1972. The European Communities Act 1972 was confirmed as a result of a Referendum in 1975. The People in 1975 voted on whether or not to join the “Common Market” – now known as the “Single Market”. There has been much debate about whether the EU Referendum of 2016 was really about whether the UK had voted to leave the Single Market (Common Market) or to leave the EU but this is largely sophistry by those who supported the Remain campaign (The campaign set up by the European Movement). Delivering on the Referendum means leaving the “Common Market”. Unfortunately the large majority of MPs in Parliament still support membership of the Single Market. When negotiating “Plan B” the UK must not be bound forever to the Treaty that is obtained. There must be a withdrawal clause. Even the EU Treaties have a withdrawal clause (Article 50). The reason for this is that in, say, ten or a hundred years time it may be essential for the UK to withdraw from the Treaty. If there is no withdrawal clause then the other parties can, rightly, claim that the UK is violating an absolute obligation under International Law. If UK withdrawal were to create difficulties for the other parties they would be entitled to enforce the Treaty by war if necessary. Agreeing to Treaties that have no possibility of withdrawal is insane. The Northern Ireland protocol in the current Withdrawal Agreement is an example of such an insane clause. Any “Plan B” for Leaving the Single Market must deliver the optimal Economic outcome in terms of flexibility and wealth. 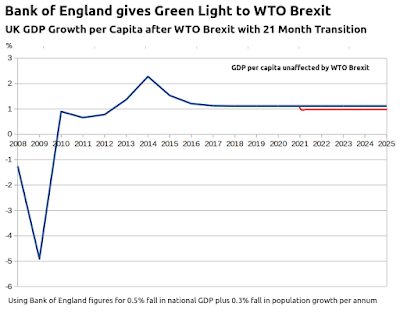 The Bank of England has recently provided predictions that a managed WTO Brexit with a 21 month transition period will, over the next 5 years, result in little difference in our prosperity compared with remaining in the EU. This leaves the UK with as much flexibility as any independent state to make Trade Deals with other countries. The only conceivable reason that such a plan would not be enacted would be to stop Brexit. This approach to Brexit can use the Mutual Recognition etc. outlined in the current Withdrawal Agreement and be finalised in days. Whenever there are international treaties countries with grievances will attempt to use the Treaties to address these grievances. The Irish, Spanish and, to some extent, the Scots will use the Withdrawal Agreement to address their grievances. The Withdrawal Agreement is not the place for this aggression. Negotiations for withdrawal from the EU should, from the outset, have made this plain. In the case of the Irish the offer should have been a soft border if the Irish sign the agreement or the hardest border the UK can construct if they do not. We have seen from the Irish approach to UK Withdrawal that they are happy to play hardball, the UK should make it plain that the process can be reciprocal. Make no mistake, the Irish have been prepared to use the “threat” of a resumption of terrorism to get their ends and must be dealt with firmly. (Note that the Good Friday Agreement scarcely mentions trade or borders, there is no requirement to cede a “frictionless border”). Spain can be dealt with in the same fashion. The UK must not cede its independence because this might upset the Irish who have in recent times financed death and destruction in the UK for their National aims (during a time when they too were members of the EU). The UK Government must do its best for the UK with as much care for the Irish as possible but must not simply give in to Irish demands. See Solving the Northern Ireland border problem after Brexit. Without this Plan B will not happen.